Discover a Way To Invest with Confidence. You have goals and we have the team to help you reach them. The number one goal is to provide you with a first-class, customized service experience to best suit your retirement objectives. Our philosophy is centered around you. Constant Communication – You will always have someone to speak with by phone or email. Your needs are always the forethought in our minds and that’s why you’ll have access to 100% paperwork assist, regular portfolio updates and 24/7 account access. With simple and easy communication, you’ll immediately know you’re a valued client and important to us. Dedication to Education – From client breakfasts to large scale conferences with top experts in the industry, we are dedicated to empowering you with education and information essential for success in today’s world. The psychology behind retirement portfolios are different. A retirement mindset is focused on capital preservation and income as you need be able to live off your portfolio for the rest of your life. As your advisor and fiduciary, we must be cognizant of your risk tolerance going into retirement as it may very well be different from your working years. 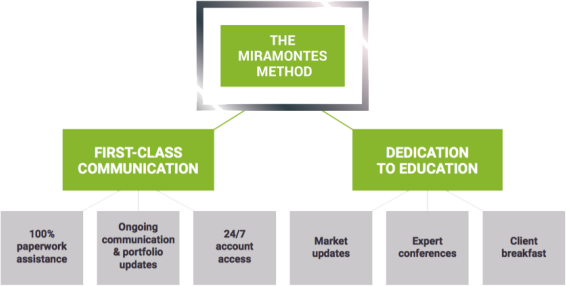 With your needs in mind, Miramontes Capital has poured thousands of hours into research and pulled from thousands of hours of experience to craft an investment philosophy that is the basis behind every portfolio. While each individual’s investments will be different and tailored to their specific needs, the premise behind the portfolio lies in a few grounding principles: a strong foundation, income, and growth. When it comes to the foundation of your portfolio, we need to think about your income needs. Almost every retiree is going to start taking monthly withdrawals at some point during their retirement. When it comes to your portfolio foundation, we start off with bonds for capital preservation and interest paying income. With their conservative nature and less frequent volatility, bonds are a stronghold in many of our client accounts. They provide a steady stream of income through yields in times of volatility. Our next layer is dividend paying investments. When we know we can count on a dividend going to cash, it alleviates the stress the portfolio carries in terms of selling shares for income. To a lesser extent, this can also mean individual stocks that have an attractive dividend yield. Many clients seek dividend paying investments that pay out monthly or quarterly. With a good foundation and steady income, we can now focus on growth. The last layer of your portfolio adds diversification and income by investing into sectors of the market. When we choose pieces of the market, we are able to hone in on the growth or yield of an area that suits your specific lifestyle wants and needs. For example, if you are in need of more income, we may opt to add real estate specific investments because of the income generated from those investments. If the portfolio could use added growth because you are not quite ready to pull an income but you plan to start soon, we may add technology because of its rapid growth. And so, with a selection of sectors of the market, we mold each portfolio to meet the array of needs of each of our retirees. Now you’re ready to enjoy your new beginning!